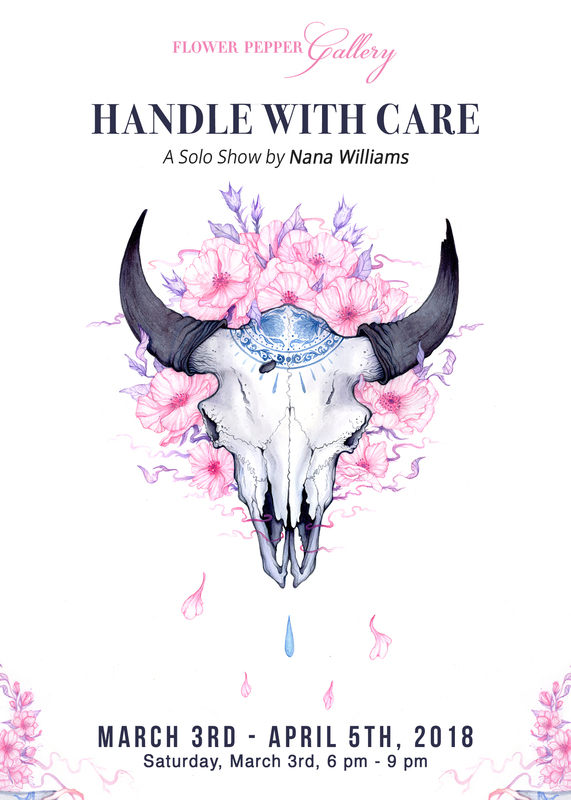 On Saturday, March 3rd, Flower Pepper Gallery is pleased to present, Handle with Care, A Solo Show by Nana Williams. With nature as a great source of inspiration, Nana Williams seeks to highlight some of the planet’s most vulnerable species. "The pieces I’ve created all focus on endangered species with an emphasis on (illegal) wildlife trade and human destruction. I chose some of the most endangered animals in the world to underline the severity of the situation.” However, while many artists choose to portray endangered species, few do so with such care and devotion with artwork that is both immensely powerful and completely fragile at the same time. Her unique style lends itself to this paradox as bold and sometimes intimidating creatures are transformed with subtle hues and ethereal textures. “The porcelain skin is to show the fragility and value of these species and the nature around them.” In her piece, Ceratotherium Simum Cottoni, we see the head of a beautiful Northern White Rhinoceros rendered as delicate porcelain with traditional cobalt blue florals. Its two stunning horns are being separated and lifted from its body, which highlights a narrative that we unfortunately know too well. This once powerful creature is helpless to the forces that prey on it. This painting is hauntingly beautiful and it carries an ominous truth that breeds empathy from those who see it. Likewise in Panthera Tigris, a majestic tiger lays in front of a line of tiger bones, which are often harvested from it for “medicinal” properties with no scientific evidence. As its stripes waft up into smoke, it looks us in the eyes and we are forced to ask the question of what this beautiful creature is worth to us. How could it be that its life is less important then the sum of its parts? In addition to her pieces representing porcelain, she also has completed a series of specimens that are not usually given much thought or sympathy. “I also have about 10 pieces of various insects which represent specimen collection. All of the insects (plus one arachnid) are endangered because of human influence, and some of them are often found illegally for trade at insect shows and can be sold for thousands of dollars per specimen." Rather then portraying these insects simply as specimens to be studied, Nana Williams has given them a seemingly spiritual aura. Emanating light and wafts of ribbon-like smoke, beetles that were once armored and daunting are transformed into gentle aerial beings and appear as delicate as the haze that surrounds them. Endangered moths are given symbology to represent their mystery and presented as sacred guides amongst light and florals. There is an overall elevated sense of worth given to creatures that are normally cast aside and we are confronted with the beauty that would be lost should they be forced to disappear completely. This exhibition is a thoughtful and meticulous effort to draw attention to those whose very existence is in danger and lack the voice to protect themselves. Nana Williams' compelling work acts as a much needed reminder. Even the most unique and formidable of creatures are in immense danger and to save them we must be willing to swiftly intervene and humbly Handle with Care.